One of the greatest advantages I’ve had as a parent is that before having my own kids I loved learning about kids. When my kids were born I already had an incredible assortment of parenting tools ready to put into place because of my experience as a preschool teacher. Of course as the kids have grown I’ve learned more, not only about kids in general but also about my kids specific personalities and strengths. Parenting can be challenging and some days are really, really hard… but I love being a parent. Part of that love comes from the confidence that I can figure out whatever challenge comes along. 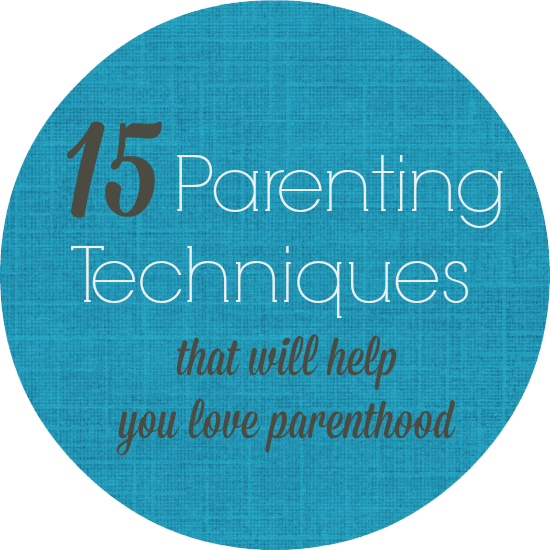 I’ve rounded up some of my favorite (tried and true) positive parenting techniques and created a list of 15 parenting tips that continue to help me along the way! Set up a good bedtime routine. Everyone feels better with a good night sleep and everyone sleeps better when bedtime is restful. When we switched to a better bedtime routine a couple of years ago, everything changed. For over 2 years now we have enjoyed a peaceful, loving and HAPPY bedtime. Well rested kids (and parents) can handle the rest of the day at their best. Parenting becomes so much easier! Work on building self esteem. Confident kids can make mistakes, handle surprises and learn hard lessons because they understand what is important about (and to) them. Make building self esteem a priority and you’ll find that everything else seems to fall into place. Let them run it off. Kids with a lot of energy can play havoc on their parent’s patience level. Instead of yelling and screaming for your kids to settle down set up a place for them to burn off some energy at a moments notice. We call it doing laps and use this energy buster often! Use the dinner table! Dinnertime is a great time to connect with your kids and there are so many different ways to make it easier for everyone. To get our dinner conversation going we play a little game of “best and worst”. Limit screen time. It is really hard to connect with anyone when screens are on. We don’t eliminate it altogether but by limiting screen time we open up time for unplanned conversations, playful interactions and we are able to make the most of our downtime! Get down on their level. I honestly think this is one of the most important parenting tricks I’ve ever learned. Since it’s a point best made with a visual, make sure to click through and see why I think it’s important to look them in the eye. Remember to say yes. It’s not always easy. It’s not often easy? But if you can find a way to say yes to those dreamy requests made by your little one, something magical will happen. Your kid might feel validated, your family might learn something and you just might have some fun! Create a positive parenting behavior book. As I shared in the post Positive Parenting Behavior Book, my Little M has some strong emotions. Creating a behavior book has been our #1 way of reaching her when there is a behavior we want to modify. Have a sharing policy. Asking your kids to share all the time isn’t reasonable. Try thinking of it from an adults perspective. When was the last time you handed over your perfectly prepared dinner plate just because? By setting boundaries around sharing you’ll actually remove some of the anxiety and sharing will become easier for your little one! Encourage sibling love. They won’t get along all the time. Heck, I wouldn’t even want them to. Who better to learn important friendship skills than with the peer who loves you most? That said, encouraging a base of sibling love will help in the tense moments and shine in the best moments. Learn how to handle big emotions. Emotional outbursts can feel scary and sudden and overwhelming. It’s hard to know what to do in the moment, especially if you don’t have a good plan already in place. These tips for handling anger will help you be prepared in the moment. Also be on the look out for “umbrella feelings” that can loom over every part of your little ones life. Bring on the smiles. How does that saying go? If Mom’s not happy, no one is happy? Well let’s flip that. When Mom is smiling and laughing it’s hard for the rest of the group not to join in! Here are 9 1/2 ways to make your family smile. Be ready for the hard times. Parenting can be tough. There are days when your thoughts are actually working against you. For those days have a rally cry ready to go, push yourself through and remember… YOU ARE A ROCK STAR PARENT! Which of these positive parenting techniques were new to you? Any that you can’t wait to try??? These parenting books (and self improvement books) have helped me become a more grounded and happier person/parent. These are affiliate links. The Miracle Morning: The Not-So-Obvious Secret Guaranteed to Transform Your Life (Before 8AM) — This book helped me find the why behind my day to day parenting journey and ensures that I get me time before the kids are even up. The Family Board Meeting — This one is all about creating quality one on one time. I’ve read the book and scheduled our first board meetings. We are all excited! Did you find an answer to the problem your facing right right now? This post is packed with great info, but sometimes it can be hard to see how the tools will fit your specific situation. Click on over to Ask Jill and ask me for advice on your specific parenting issue. What an inspiring list – thank you! Great post! I am so with you on downtime and limiting screen time. Just think if every parent followed these important parenting tips? We would have so many happy, confident, well behaved children:). Great post!!! I love this reminder – thanks! this was very nice to read, very inspiring and opened my eyes to a few things. my husband is good at getting down on our son’s level but I need to kick up my game. pls feature how to handle a 4 year old child with so much tantrums. I don’t have children yet, but like you am a preschool teacher. I love reading articles like this that shine a positive light on parenting and positive helpful tips. Thank you.